The glorious Postcards of the late 19th and early 20th centuries. This postcard image from the early 20th century shows both the artistic excellence and the imagination that was so evident in the early postcard. Postcards without pictures were used in various European countries from the 1860's onward. The addition of pictures soon followed, but in Britain the postal laws did not allow companies to produce mailing cards until 1898. Other countries, including United States, allowed it a little earlier. This immediately let to an avalanche of new postcards. To collect them was quickly a craze. From 1890 until about 1920 there was a torrent of fresh images and they were bought and sent by the billions. Of course picture postcards continued to be made and used after 1920, but the First World War interrupted their production and the public lost interest. This period, from the 1890s to 1920 can be viewed as the golden age of the picture postcard. The different designs that appeared on picture postcards are uncountable. There are few subjects that were not pictured. The card publishers tried everything they could think of, including animals, history, humor, imaginary beings, sports, exploration, architecture, inventions, main streets, flags, politics, religion, automobiles, beautiful women, cute children, world's fairs, seashells, advertising, puzzles, celebrities, fashion–the list is endless. 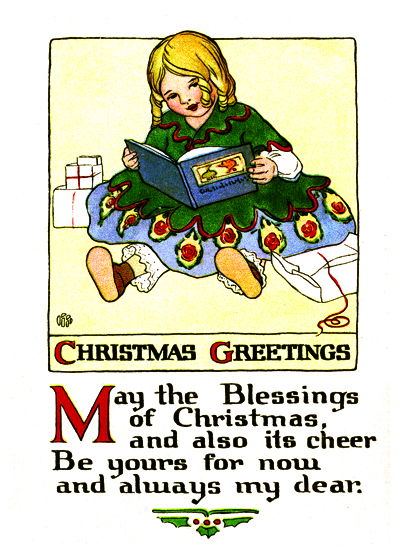 Holiday postcards by Ellen Clapsaddle. An image of an adult, such as the middle example here, is unusual for her, but she demonstrates her ability to paint something other than cute children in this more subtle and atmospheric painting of a young woman's halloween dreams. Ellen Clapsaddle (1865-19340 was an extremely popular and prolific artist of the early 20th century postcard. She produced thousands of paintings, usually of appealing children celebrating holidays. She was the child of Dennis L. and Harriet (Beckwith) Clapsaddle. From an early age she loved to draw—she is said to have been a shy and delicate child who displayed artistic ability and was highly encouraged by her parents to develop her skills in art. Clapsaddle was the great-granddaughter of the American Revolutionary War hero, Major Dennis Clapsaddle. Postcards, more often than the modern postcard, offered greetings. They were obviously meant for use as a holiday greeting before the widespread use of a card in a envelope became more popular. Christmas was the richest of all holidays in postcards. Santa Claus naturally dominated, but almost every aspect of the season was shown. Snowmen abounded. Christmas trees and house decoration were frequent. Gift buying, wrapping and giving were prevalent. Christmas morning, around the tree, was a favorite subject. Religious images were rare. 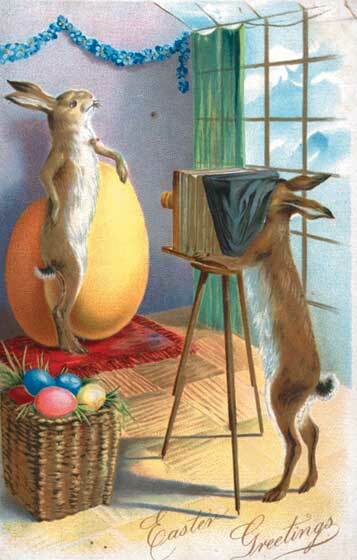 The Easter postcard was apparently extremely popular, judging by the number of vintage postcards that are available. This Easter postcard is one of hundreds that showed rabbits in an endless number of activities that relate to Easter: egg dying, egg delivering, interacting with children. Postcard artists also thought up all sorts of activities that don't seem to have a great deal to do with Easter. New Year often showed toasting, kissing, Father Time, cherubs, calendar pages or scenes of celebration. St.Valentine's Day featured, of course, lovers, but also cupids, hearts (sometimes personified), cute children, flowers and doves. St.Patrick's Day cards were strongly green and showed happy Irish children, men and lovely women. Shamrocks abounded. Easter rabbits were a favorite Easter theme, but there were also giant eggs, chickens and religious images. The Fourth of July showed us revolutionary heroes, American flags, Uncle Sam and many glorious fireworks explosions. 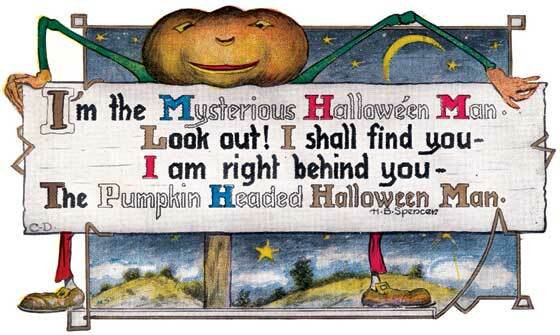 Halloween was visually spectacular with witches, black cats, pumpkins of all kinds and sizes, costumes parties, owls, scenes of fear and riot. Thanksgiving was more limited in themes; turkeys, pilgrims, feasts and harvest time. Holiday picture postcards are so many and so various that it is difficult to generalize, but for every holiday there were cards of such beauty and truth that they deserve to be remembered.